Yesterday my odometer rollup to to the point you see in the photo. 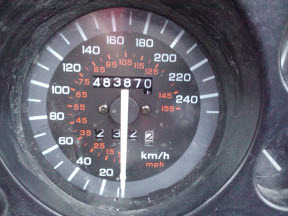 Looks odd, but when you apply the simple kilometre to mile conversion of .62, it equals 300,000 miles. That's a pretty high and notable figure. In actual fact, if a more accurate conversion is applied, it is something like 300,600 miles. No need for hair splitting, however. The number that matters most to me has yet to arrive. That number is 500,000 kilometres. I'm not going to get there in 2011. But that figure should occur around May 2012 timeframe. This winter I will give the Green Hornet a nice refresh with new fluids, filters, plugs, and brake pads in order that spring riding starts up and continues smoothly.